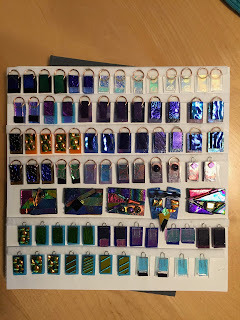 Here's what I finished this year. 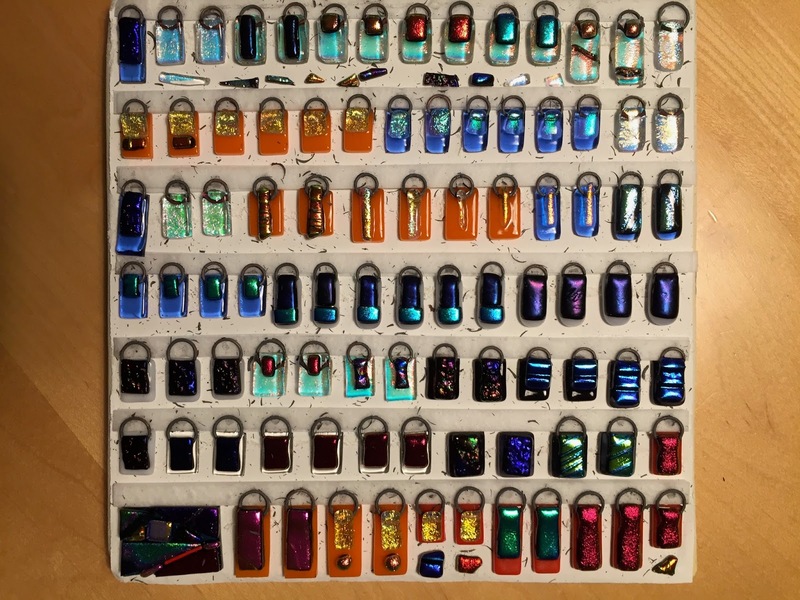 I post it here to keep a record. 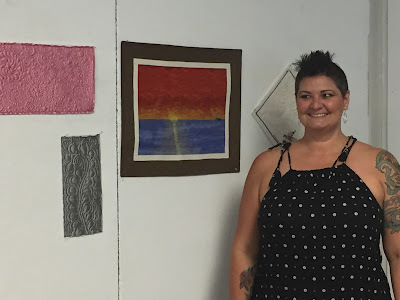 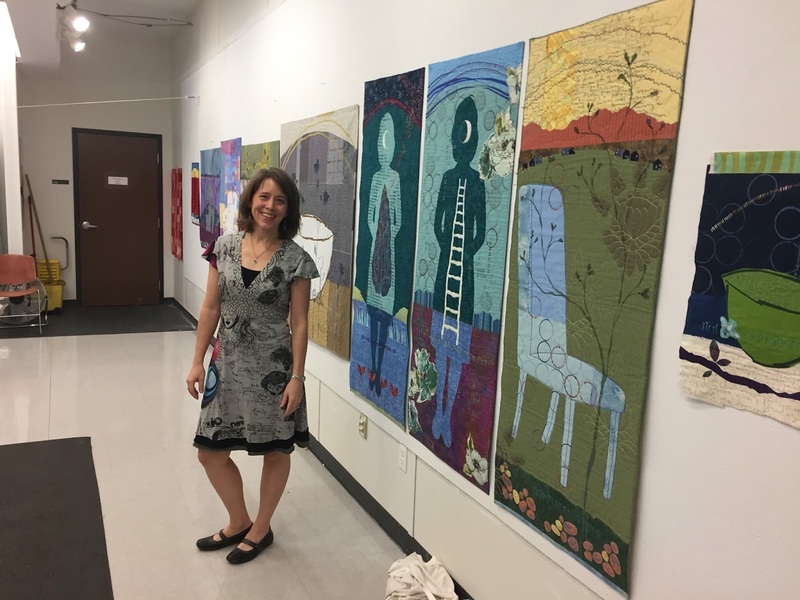 Connie Keller, local APQS rep and UNT Fiber Art professor, asked several quilters to speak to her fiber art students yesterday. 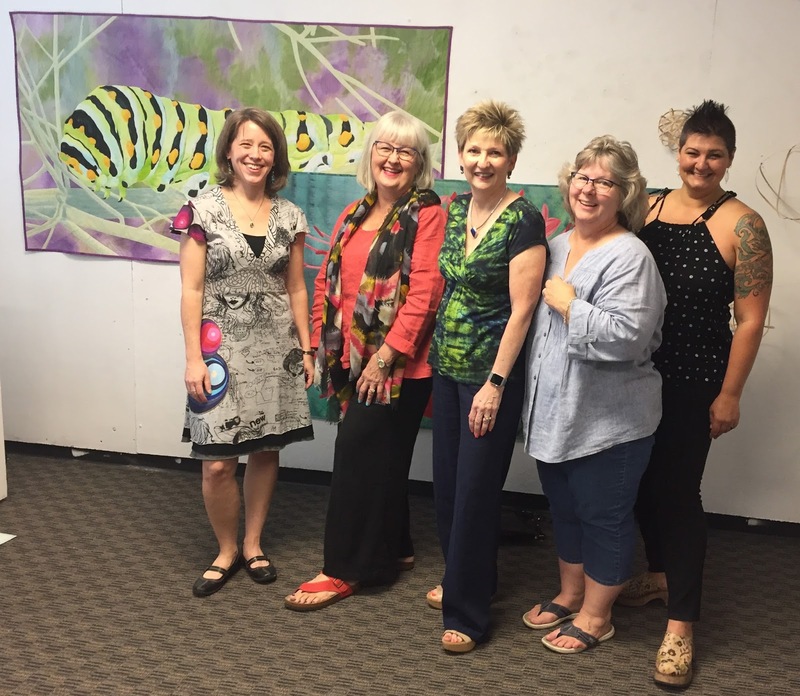 Deborah Boschert, Carol Morrissey, me, Connie Keller and Maria Hall stand in front of Carol's giant painted and quilted caterpillar. 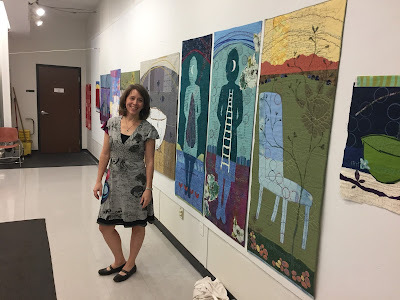 Maria quilts for the public so she didn't have big samples to show. 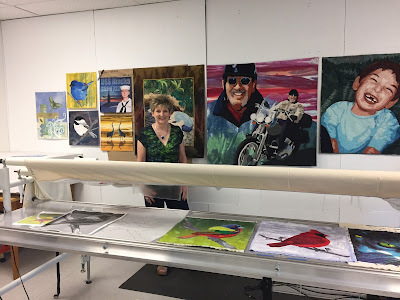 All of her best work goes home with her clients. 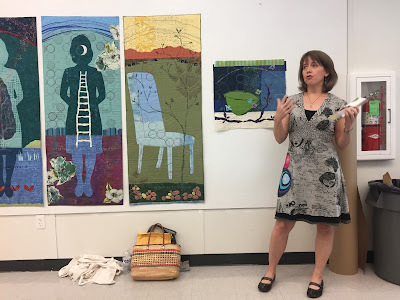 In addition to her unique collage style, Deborah talked about her book and teaching. 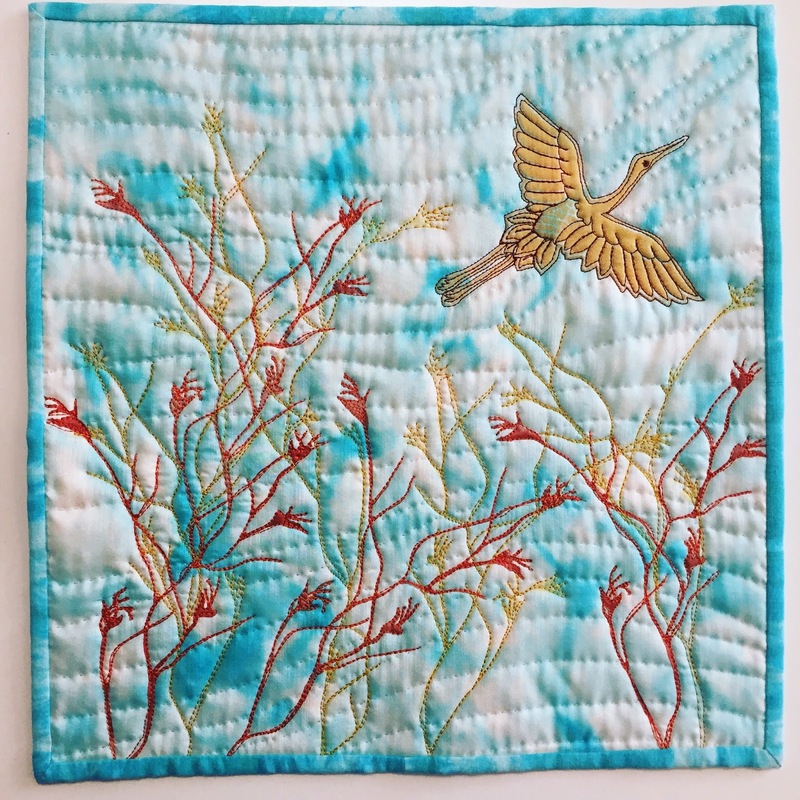 I talked about the different surface techniques I use and how I create images with fabric and thread. 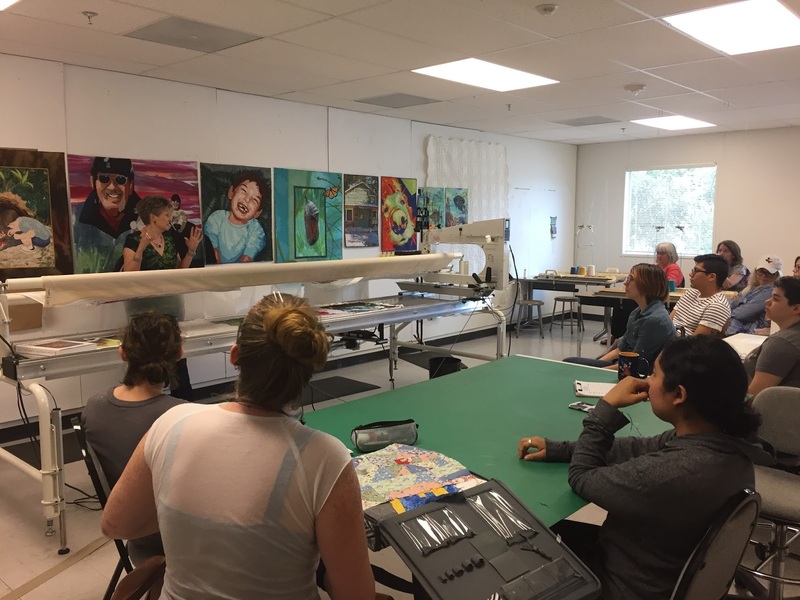 It's always scary for me to talk to a crowd but the students were interested and welcoming, and asked good questions. 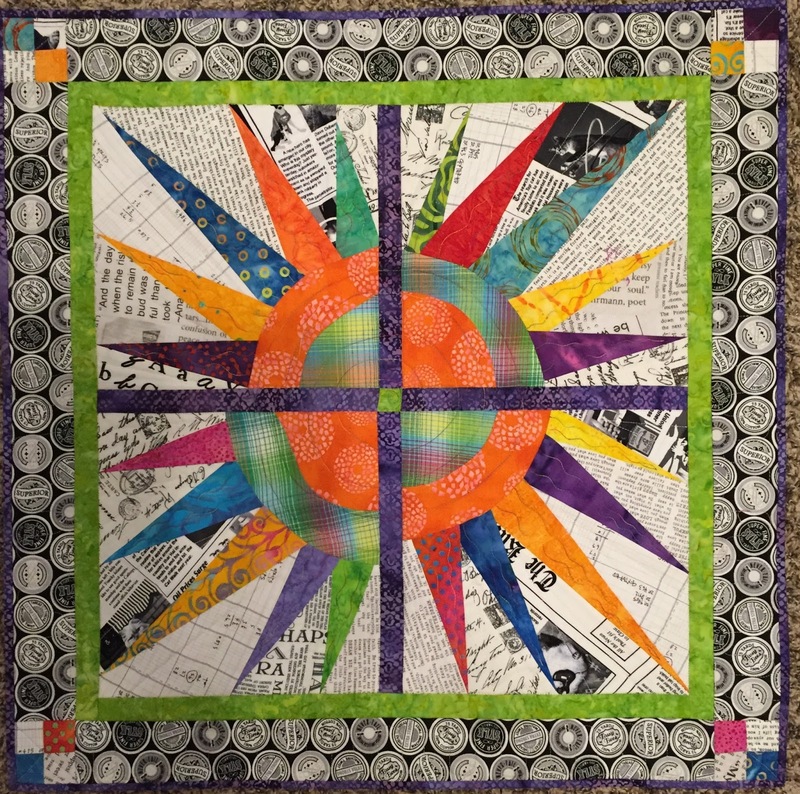 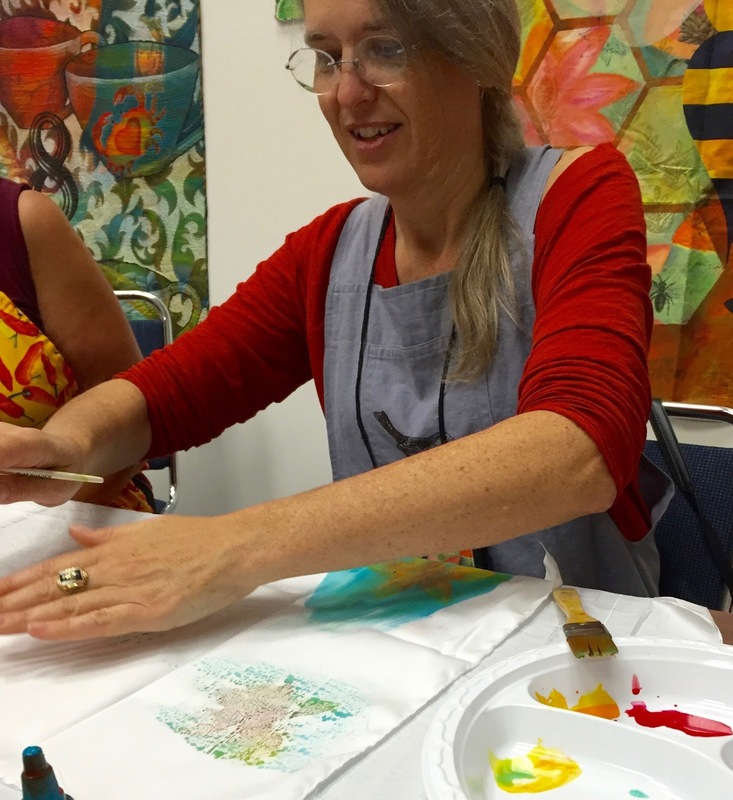 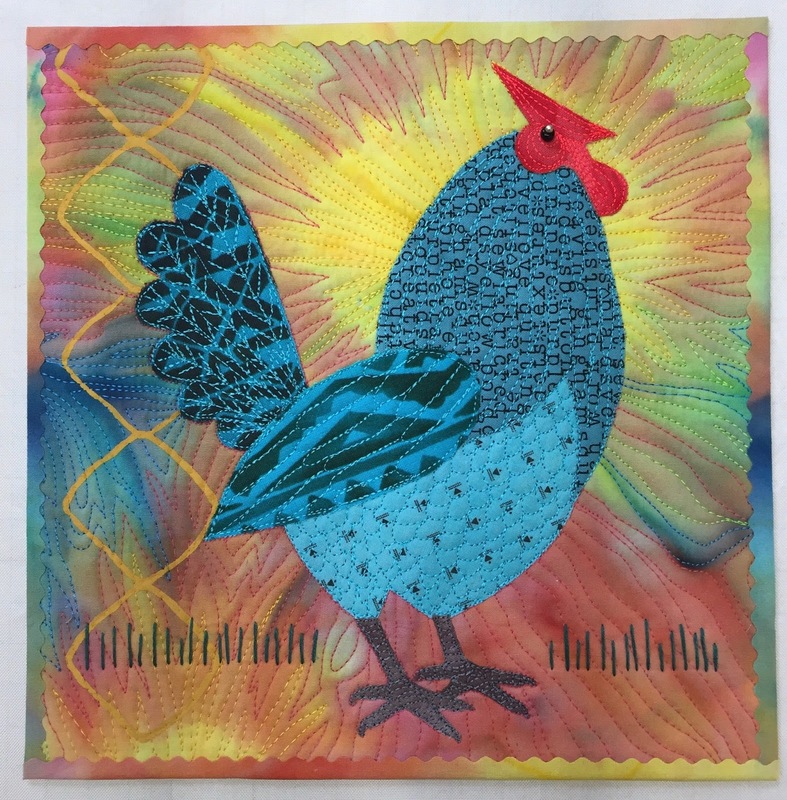 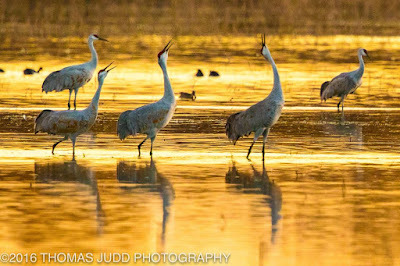 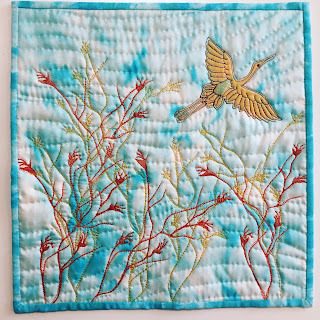 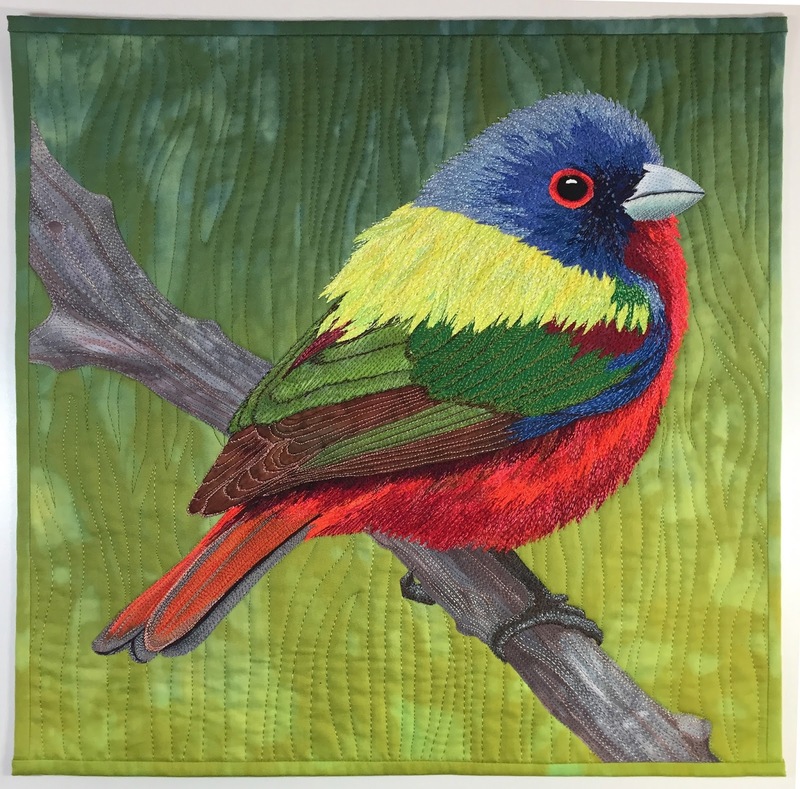 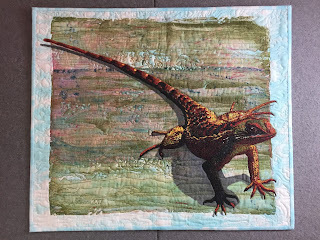 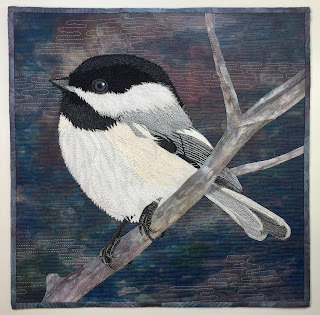 The Denton Quilt Guild has issued a challenge to make a 15" square quilt with the theme "Birds'. 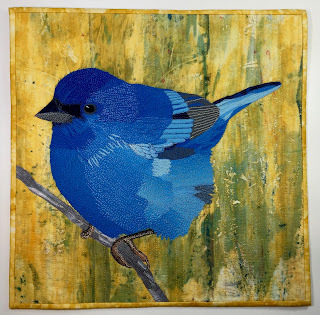 I found this great photo by my friend Thomas Judd and asked him if I could base my quilt on his image. 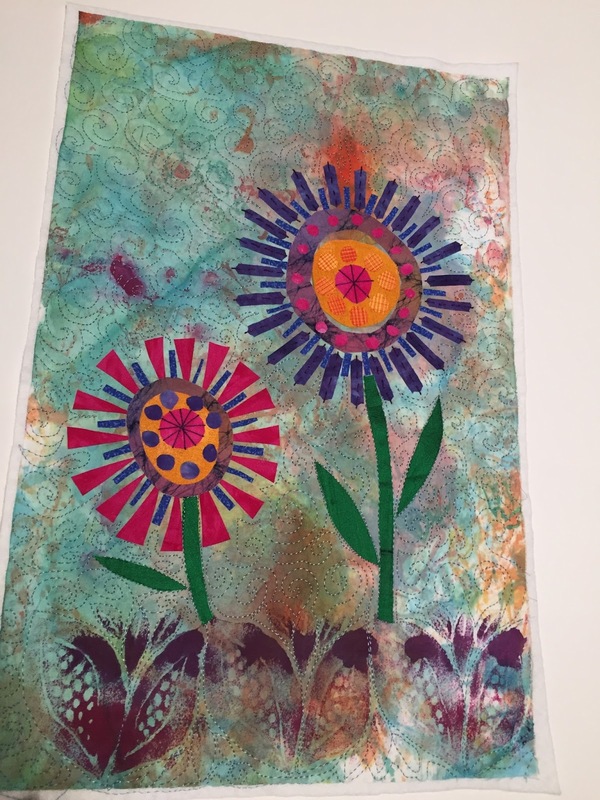 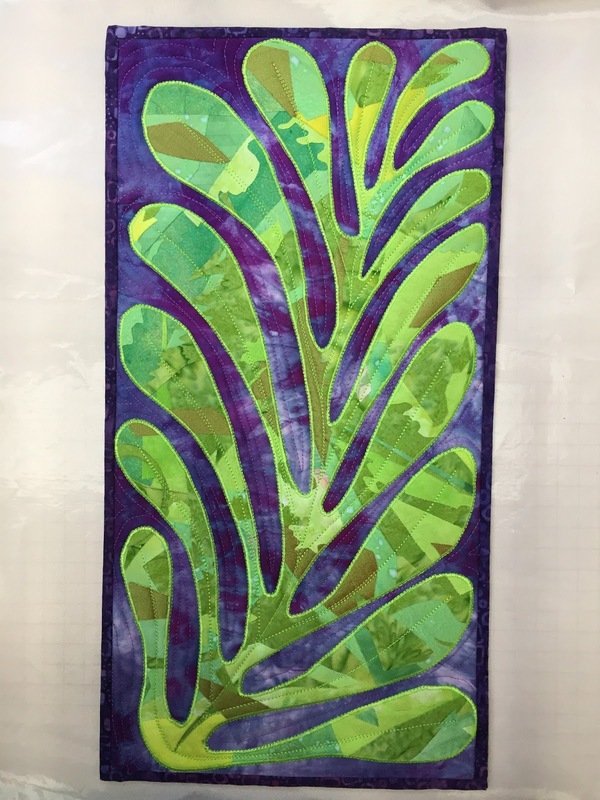 I fused the background fabrics to batting and quilted it. 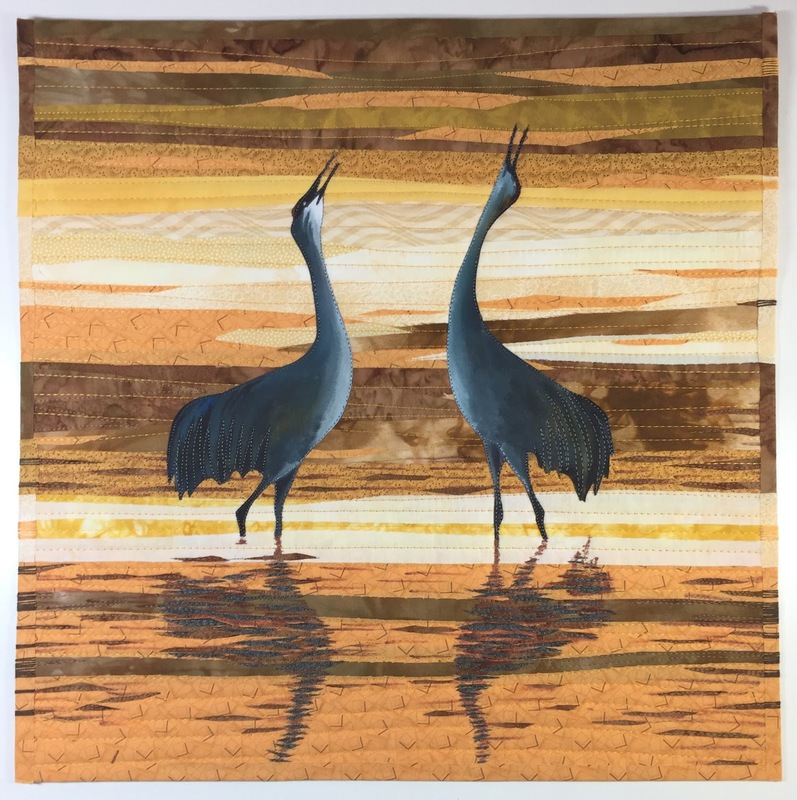 I painted the cranes with acrylic ink on PDF muslin. 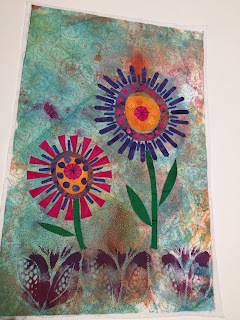 When they were dry I ironed Wonder Under to the back and cut them out. 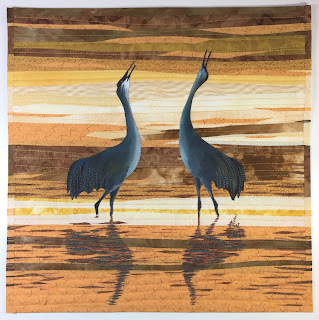 After I fused the birds to the background, I added the reflections with fabric market and fused fabric. 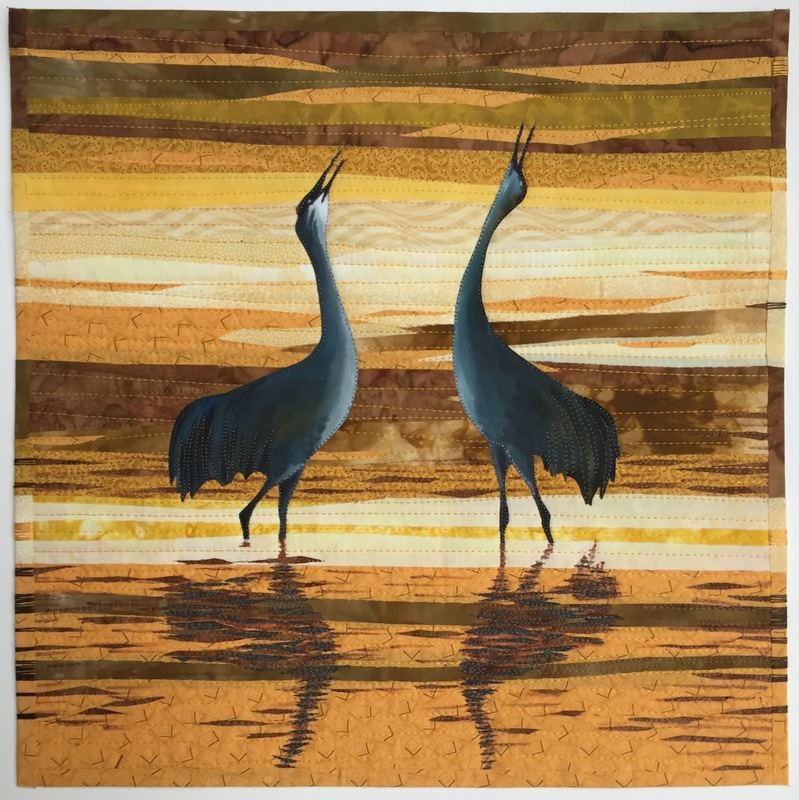 I quilted the cranes and the reflections. 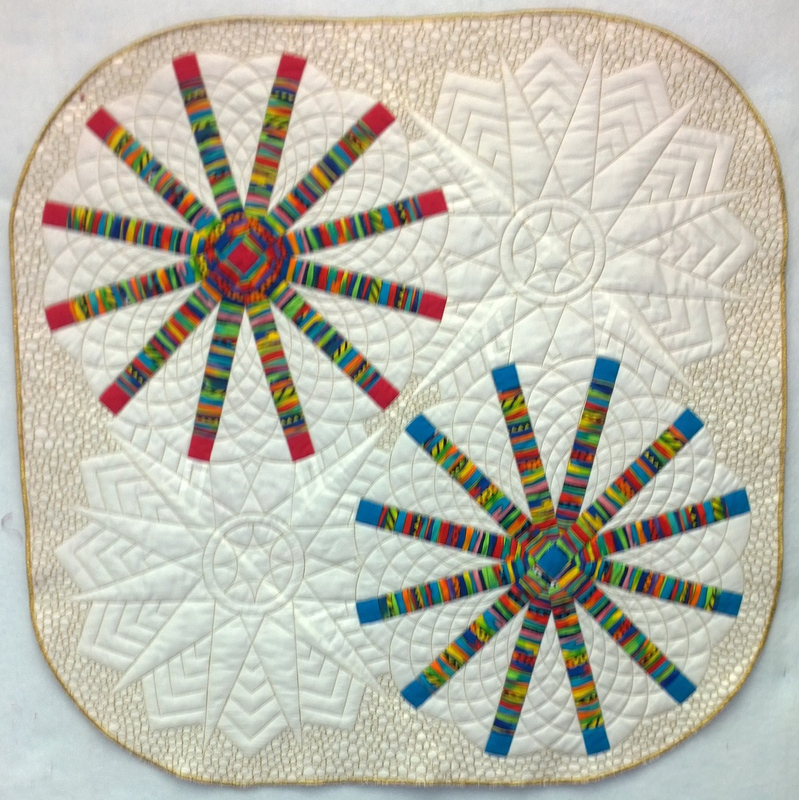 I fused the binding to the quilt and added embroidery stitches to the binding. 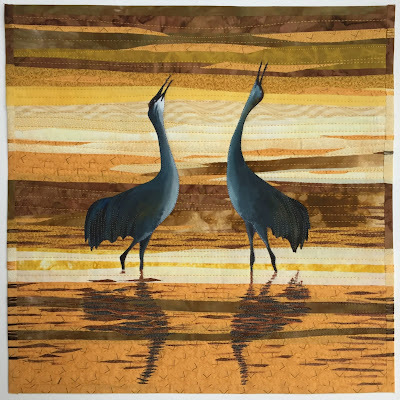 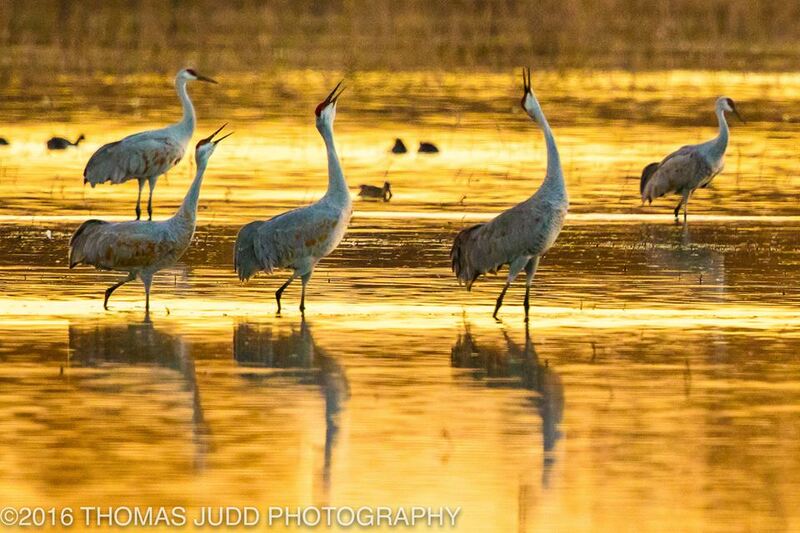 "Sandhills Singing" 15 x 15"
I had a wonderful time at the Dallas Quilt Show last weekend. 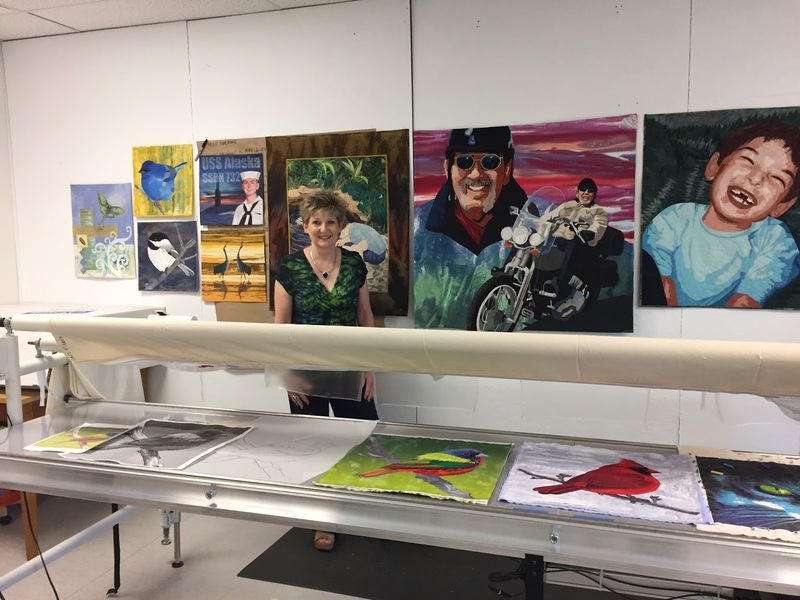 I'm on the show committee as the printed materials chair, so I work on the show just about year round. 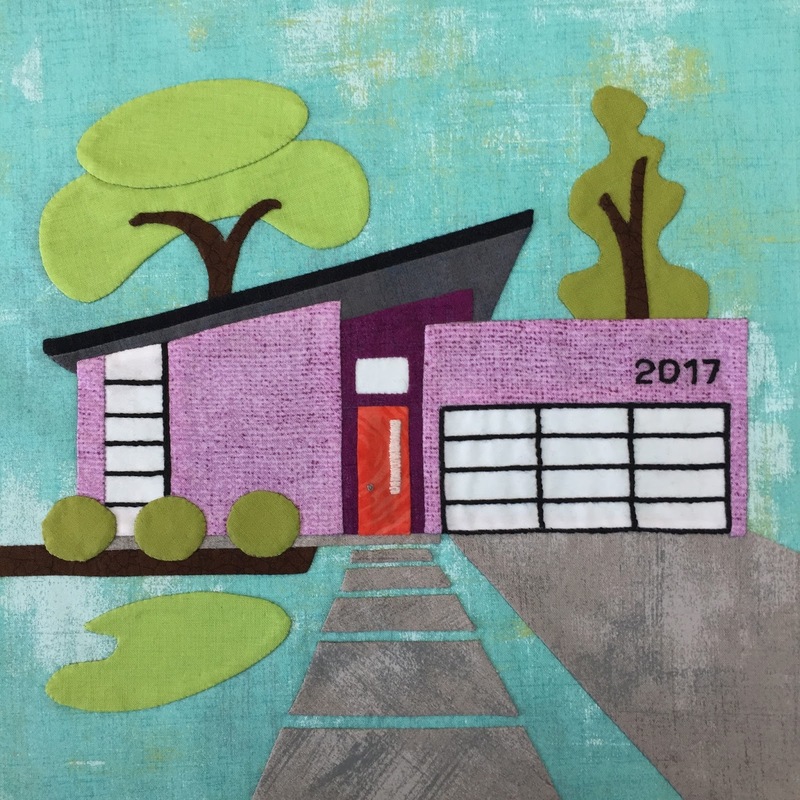 It's so nice to see all our plans come together. 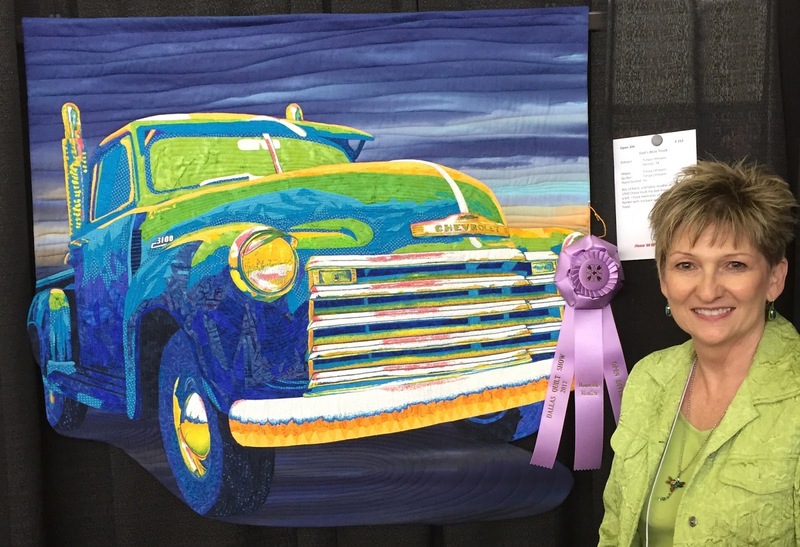 The judges liked several of my entries which added to the fun and excitement. My "Home Dream Home" challenge block won the first place ribbon. The block is 10 x 10". 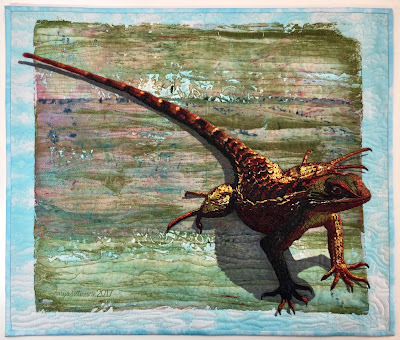 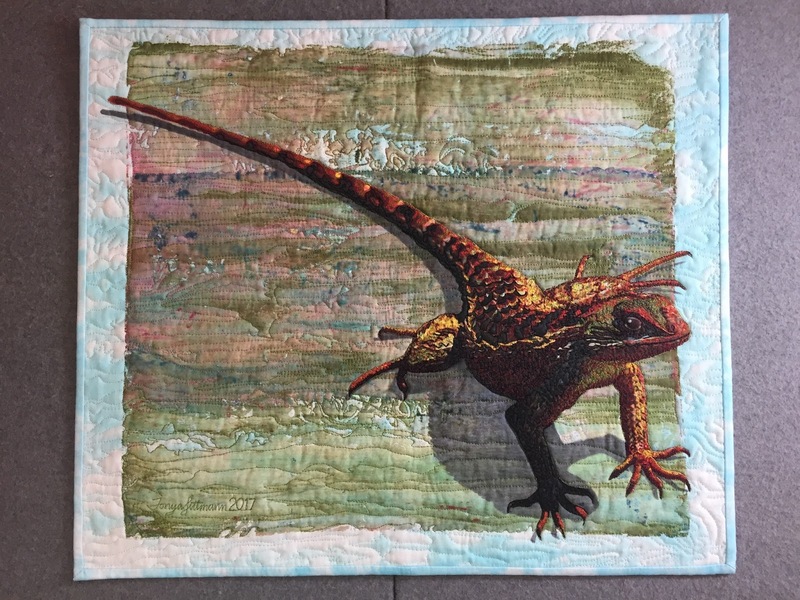 "Dr. Lizard" was awarded the Third Place ribbon in the Small Contemporary category. He's small. 20 x 17". 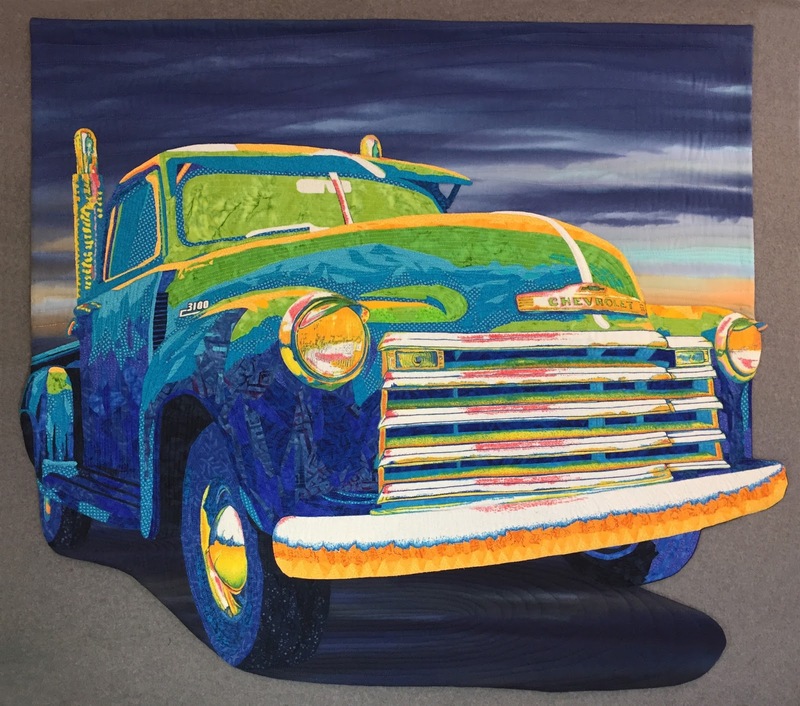 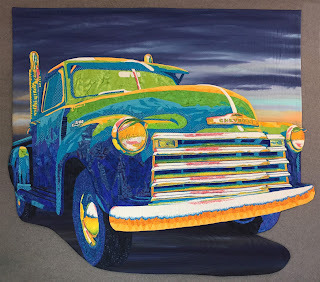 "Dad's Blue Truck" won an honorable mention in the Pictorial category. 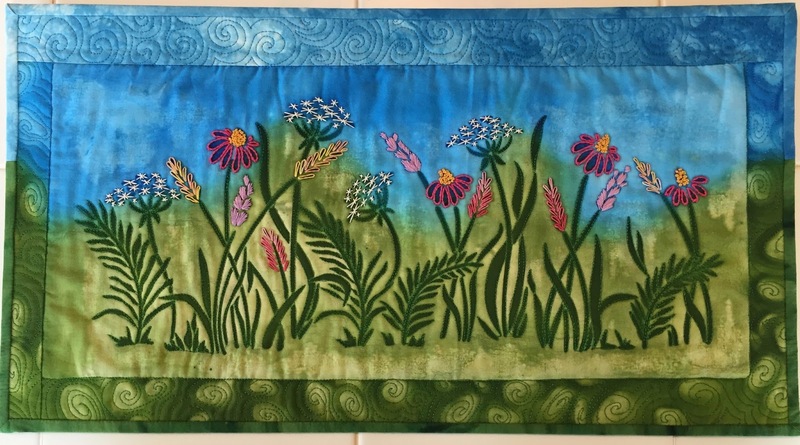 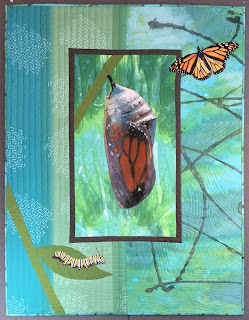 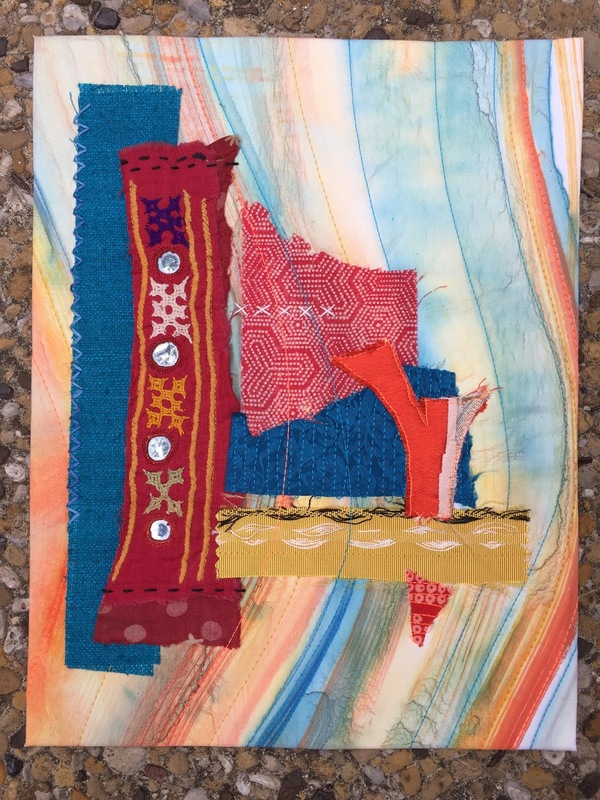 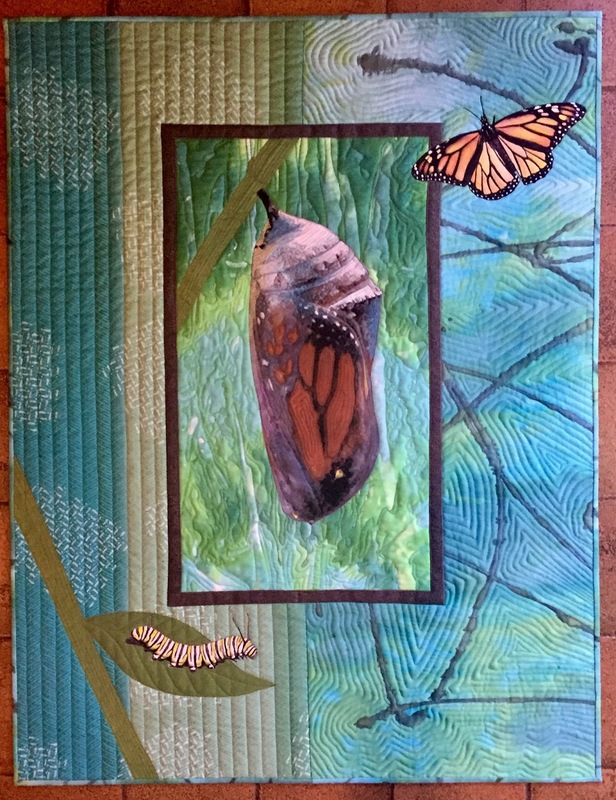 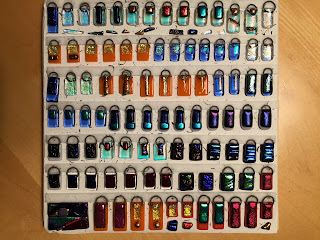 I entered "Chrysalis" in the Art Quilt category. 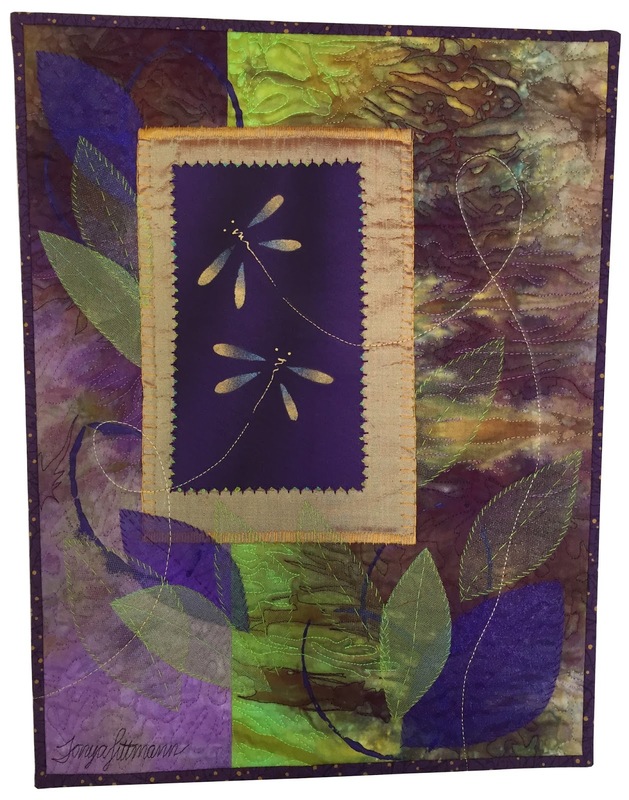 "Dragonfly Dance" was in Small Contemporary. 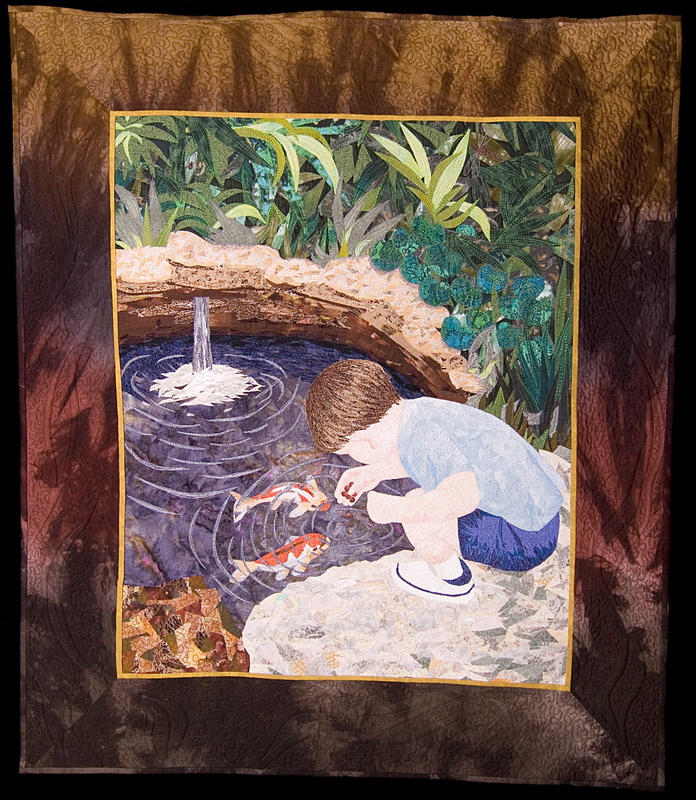 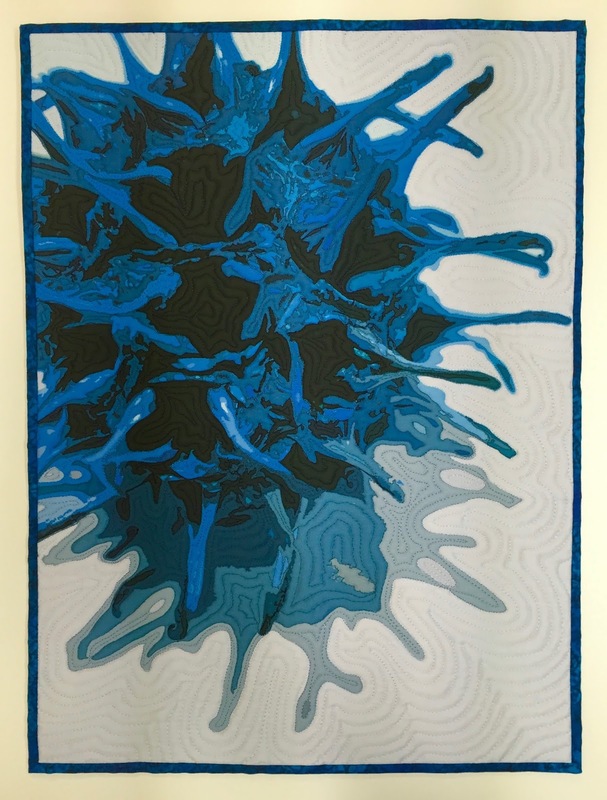 This quilt from 2000 called "Berek at the Koi Pond" hung in the special exhibit called "In The Beginning." The exhibit was made up of early guild members. 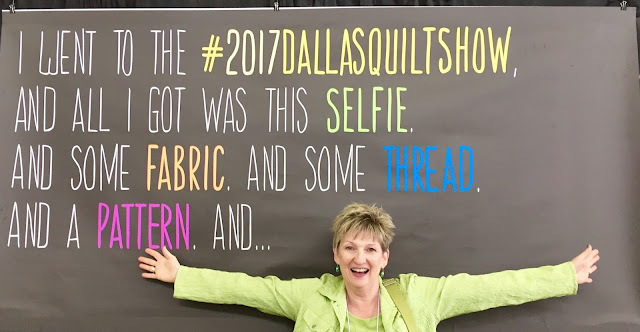 I joined the Quilter's Guild of Dallas in 1988. I'm inspired and anxious to get busy making something new. When I painted the coffee cups in Judy Coates Perez’s acrylic ink class at International Quilt Festival 2015 in Houston I knew I would make an art quilt for my long-time coffee buddy, Grace Johnson’s birthday. 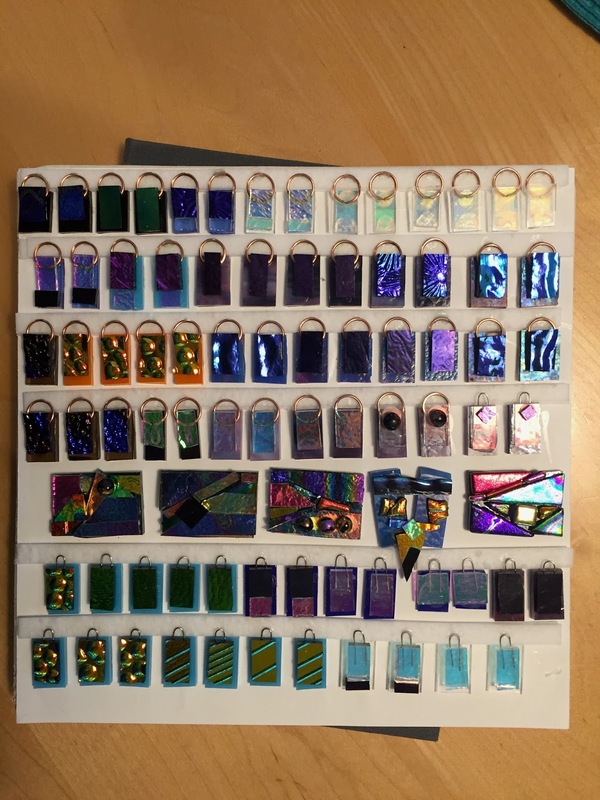 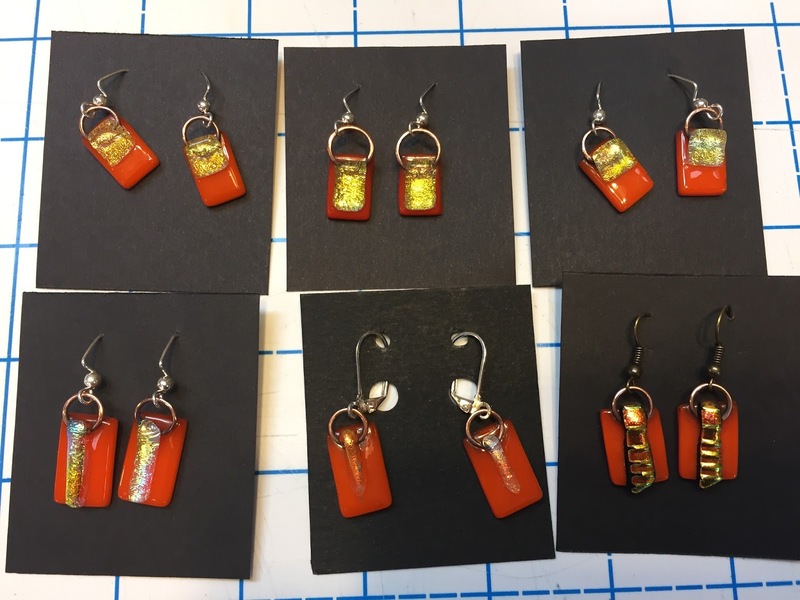 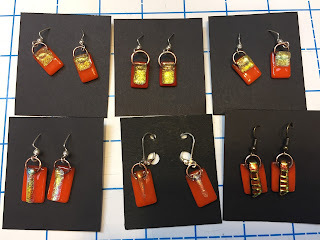 Judy had us make 10 different background samples in the morning. 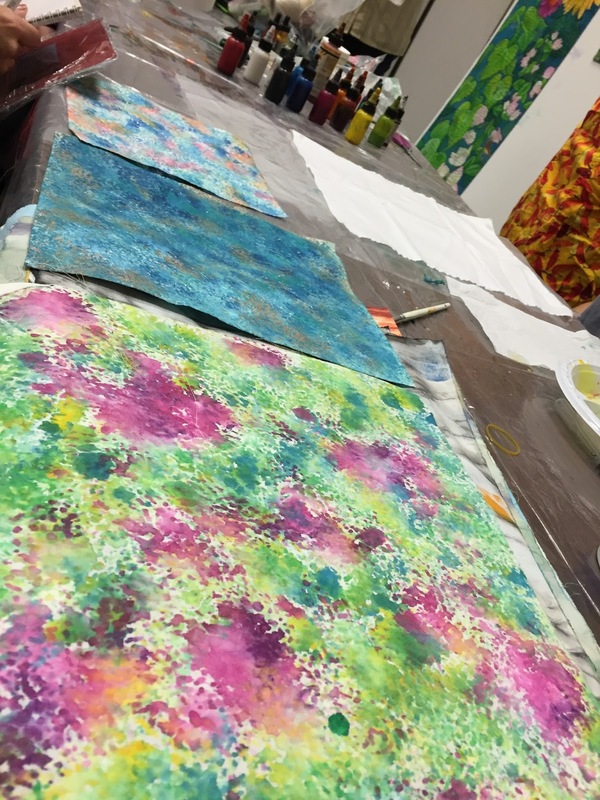 The background of the cups was sea sponge-painted with several colors of acrylic ink. 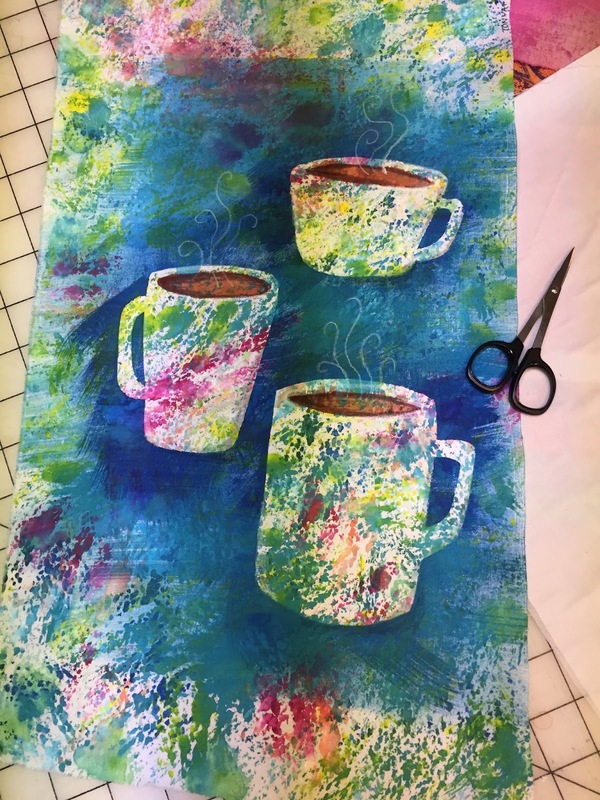 When the sponge paint was dry, I cut coffee cup shapes out of freezer paper and ironed them onto the fabric as a resist. I dry-brushed blue ink off of the edges of the cups to create the blue background. I added the brown coffee with a second freezer paper stencil and some fabric markers. 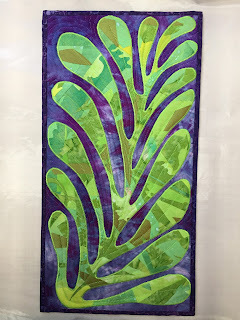 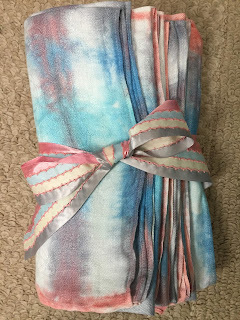 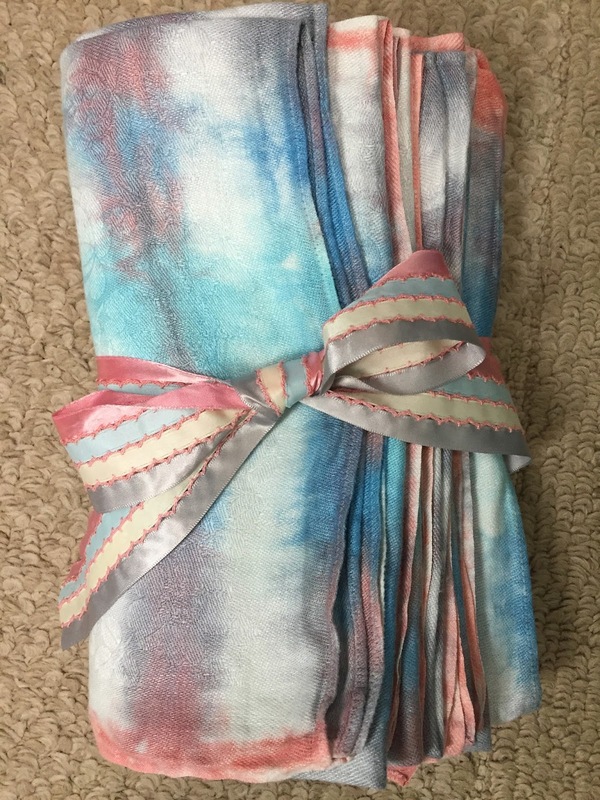 I added borders of my own hand-dyed, and some commercial hand-dyed fabric. 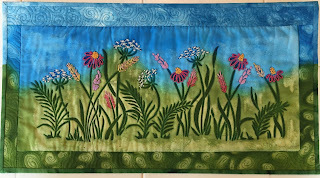 I added rice stitches around the cups and an arch to represent morning with embroidery floss. I drew the spoon with silver Sharpie and Tsukineko white ink. I sewed clear beads spilling from the spoon to represent sugar. 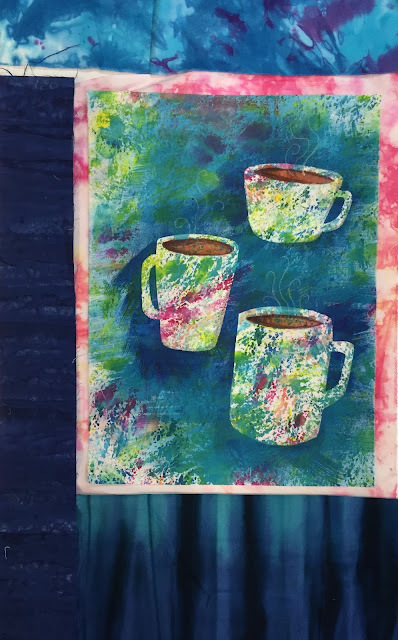 When Grace announced that she would be moving to Tulsa to be near her family I realized we had been having coffee together for 19 years. 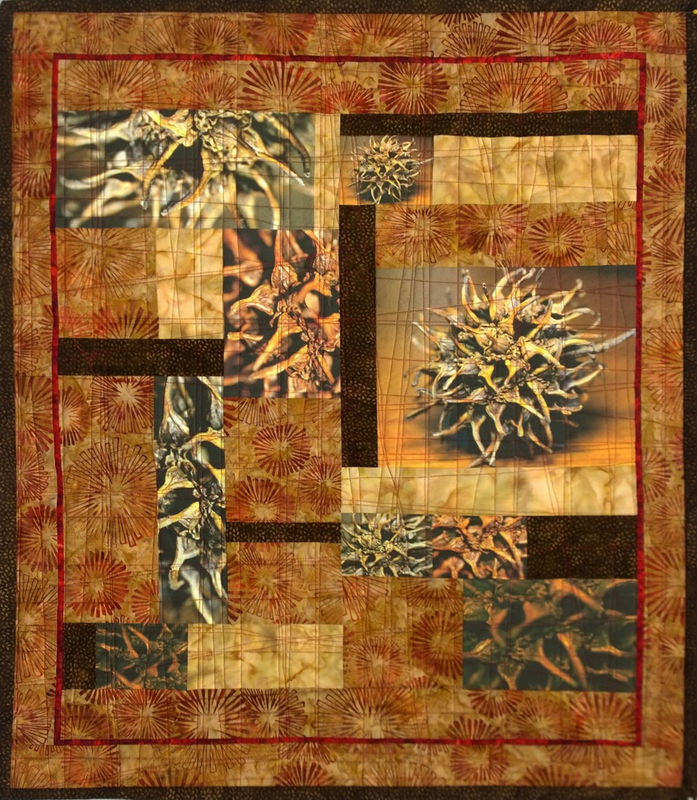 So I glued and stitched down 19 coffee beans. Coffee Memories, 12 x 24"
Grace, I look forward to visiting your new home in Tulsa! 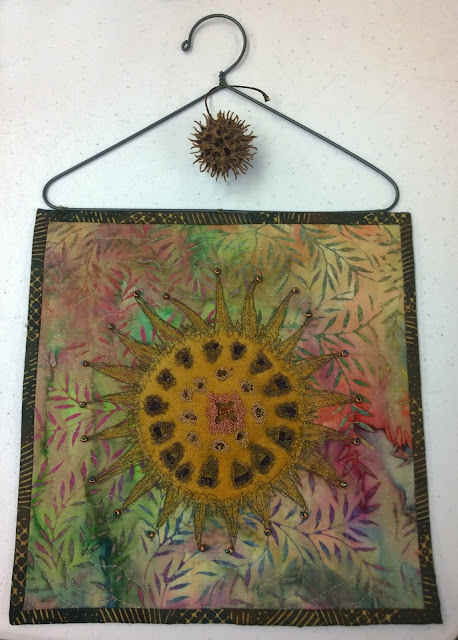 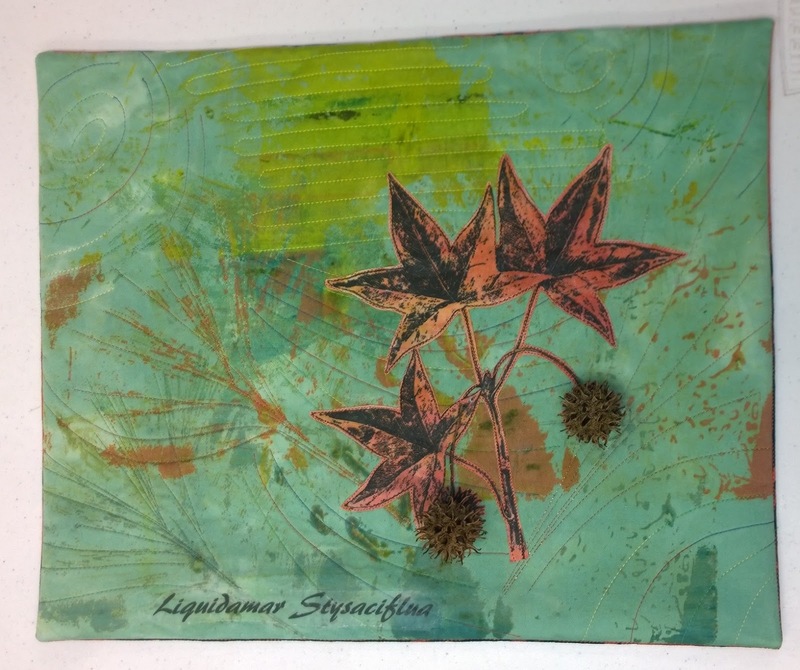 Members of the Not Your Grandmother's Bee were challenged to create something inpsired by a sweet gum tree seed pod. 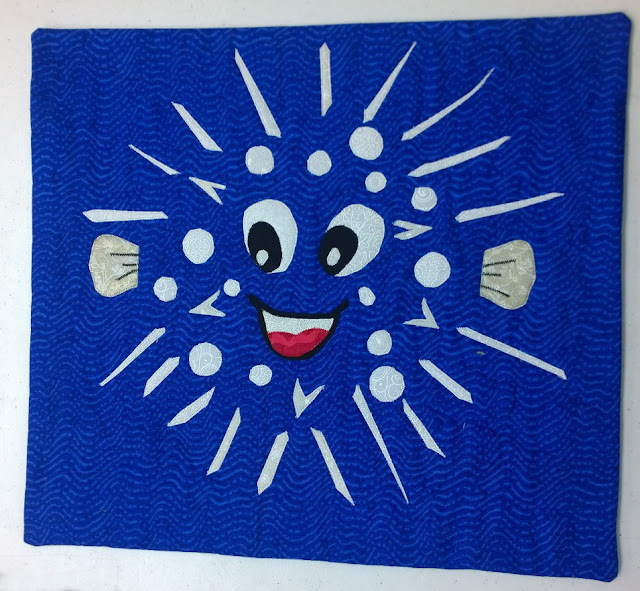 This is my "Blue Bommy Knocker." 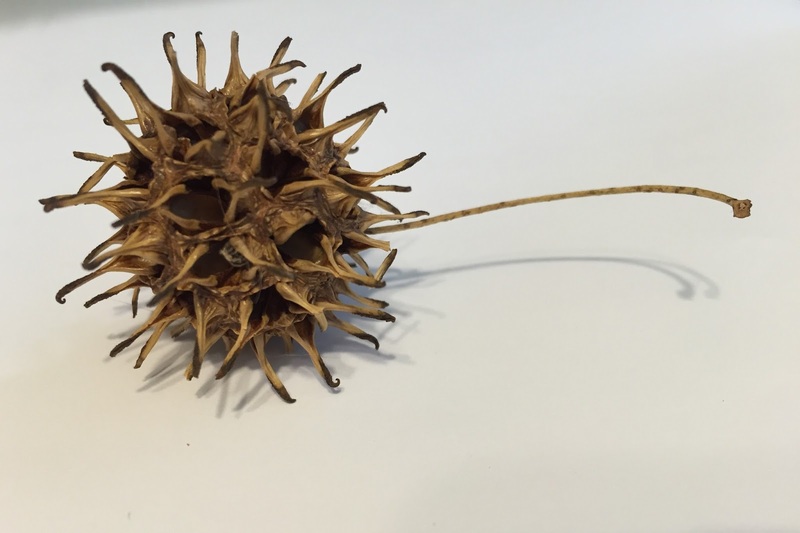 The name comes from a children's book "The Hungry Giant's Soup" by Joy Cowley where the "bommy-knocker" is a spiked club that is the giant's weapon of choice.